Renew. Recover. Repeat at Salt + Sweat in Rye Ridge Shopping Center RYE, N.Y.
Salt + Sweat is a high-end wellness lounge that offers holistic treatments that will greatly improve your daily life and long-term health. Salt therapy also known as Halotherapy, offers health benefits to people of all ages, including children and the elderly. Their full spectrum infrared saunas provide a myriad of scientifically proven health and aesthetic benefits. Some of these include but are not limited to lowered blood pressure, muscle recovery, revived circulation, improved heart health and enhanced weight loss (burning between 400-600 calories in one 30-minute session.) By simply adding one of their treatments to your self- care routine your body will be left recovered and your soul renewed. Salt + Sweat will offer innovative treatment and technologies as well as workshops lead by wellness and health professionals and special events to provide continued education for the community. 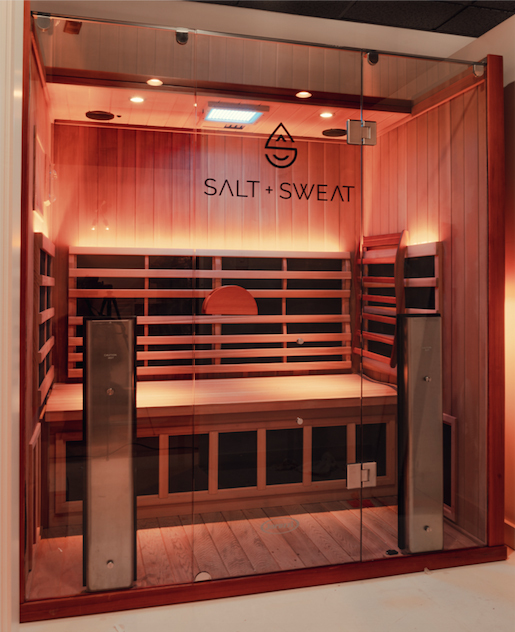 Salt + Sweat, your new favorite meditative space as well as an opportunity to give your body a full detox.